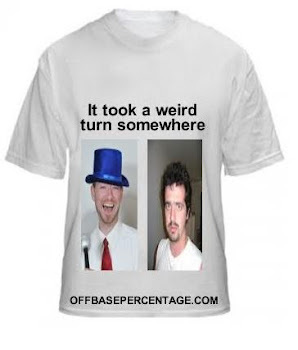 Off Base Percentage: Happy Labor Day Or Happy Birthday To Me! 1. Finish writing this while enjoying a delicious breakfast of Popeye's fried chicken and scotch. It both warms and stops my heart. 2. Shave my arm hair for a more wind resistant Wiffle Ball bat swing. 3. Apply Bryce Harper/Ultimate Warrior eye black. Do push up to psych myself up. 5. Put sheets in the washing machine, I got eye black everywhere. 6. Head over to the party house/Wiffle Ball backyard. 7. Drink more rum than Captain Morgan. 8. Strike out 12 with my devastating riser. 9. Declare war on Vermont. 10. Hit on a fire plug I mistook for a short redhead. Then I'll probably pass out about three feet from the couch. Jealous? You're welcome for the day off and celebrate my birthday responsibly. No drinking and driving kids. Uncle MTD will be too drunk too bail you out of jail. I've been informed I'm not allowed back on the Internet today so I'll see you guys tomorrow when I manage to get my eyes to function.